Upon reading our most recent post, you may remember that Mayor Sorace connected us with Gene Shaw, a kind gentleman enjoying a hot dog lunch at a table along the south side of the Market House. The table where he sat is one that he created, and the Market House in which it lives is one that he enthusiastically loves. “It’s an awfully special place,” Gene said, smiling in the sunlight. Gene reminisced of his early fresh food market days, when he went to art school around the corner from Reading Terminal Market in Philadelphia. And he fondly remembered Eddie the Green Grocer, who would clip all the greens off the Society Hill ladies’ beets and save them just for him. 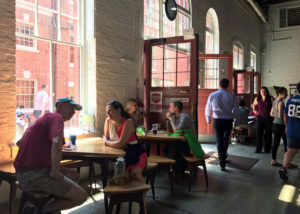 So, the next time you find yourself sitting in the sunlight at one of the tables along the south side of the Market House, take a moment to think about Gene and what he meant when he said, “Market is as much social as it is anything. It’s so pleasant.” For him, Market is about knowing and supporting the people who’ve come to be his friends. What is Market about for you? Up next, we have Feizal Fakier from Pure Palate Organic. Until then, Market friends, keep it fresh!